Ginger is mostly famous for its ability to combat nausea and motion sickness, as well as ease the symptoms of many gastrointestinal disorders. However, ginger can also help reduce inflammation as a result of its high levels of gingerols. For that reason, ginger should be considered as an all-natural remedy for treating a wide variety of inflammatory ailments, from migraines and headaches, to sore muscles, arthritic joints, and even menstrual cramps. 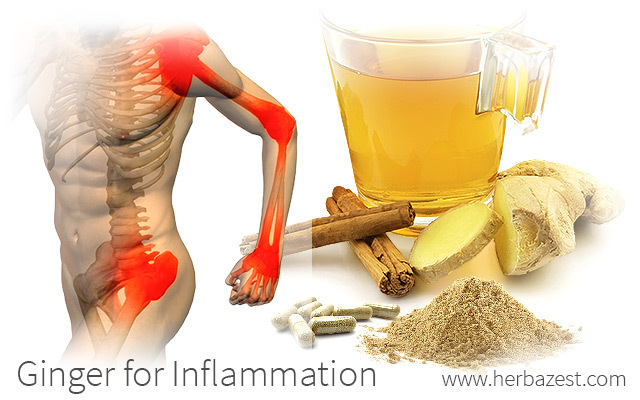 Inflammation is a general term that refers to when part of your body becomes swollen and painful. Inflammation is usually characterized by redness on the affected area, and can be triggered by many things, including overexertion, immune response to pathogens, injuries, and the effects of chemicals or radiation. One type of inflammation that can be treated with ginger is muscle soreness. Ginger is most effective in treating inflammation caused by oxidative stress - an imbalance between the production of free radicals and the body's antioxidant defenses, which has been linked to conditions such as atherosclerosis, hypertension, diabetes mellitus, cancer, and ischemic diseases. Why is Ginger Good for Inflammation? As mentioned previously, ginger properties include anti-inflammatory actions that stem from a group of compounds called gingerols, which work by inhibiting the prostaglandin-biosynthesizing enzyme, known as PH synthetase or cyclooxygenase (COX). Depending on which of the many medicinal uses of ginger is preferred, the gingerols break down into two other types of compounds. When ginger is cooked, the gingerols are transformed into become shogaols, while in dried ginger zingerone compounds are stronger. Whether gingerols are converted into shogaols or zingerones, they have an incredible effect on the herb's flavor and medicinal properties. Shogaols result in the ginger exhibiting a more pungent flavor, while zingerones tend to be sweet. However, shogaols have a greater medicinal value due to the presence of alpha- and beta-unsaturated ketone moieties, which have both antioxidant and anti-inflammatory effects. Ginger vitamins are also relevant when it comes to inflammation relief and management, mainly due to the high content of vitamin C (ascorbic acid) in this root. For those who prefer eating fresh, raw ginger, 100 grams of the root provide 5 mg of this powerful antioxidant, which helps repair and prevent the damage caused by free radicals. In that way, vitamin C not only contribute to slow the aging process, but also helps treating and preventing serious health conditions that are the consequence of chronic inflammation, such as arthritis and heart disease. It should be noted that the vitamin C in ginger will break down as a result of heat and prolonged storage or exposure to light. Therefore, in order to reap both anti-inflammatory and antioxidant ginger effects, it is best to consume the fresh root. On the other hand, dried, powdered ginger has the most potent medicinal value due to its high shogaol levels. When taking the herb in this form, a daily dose of two to four grams is recommended. Drinking ginger as a ginger tea, ginger water, ginger juice, or ginger extract has shown to be an effective remedy for soothing digestive ailments or nausea. It can even be applied topically, though it may cause some skin irritation. Ginger supplements may also be taken for treating nausea and inflammatory purposes. Another great anti-inflammatory herb is turmeric. While the active anti-inflammatory effects of ginger are due to the inhibition of PH synthetase by gingerols, shogaols, and zingerones, turmeric's most significant active compounds are turmerone and curcumin. Turmerone inhibits the production of pro-inflammatory cytokines, while curcumin deactivates amyloid proteins, which have been linked to neurodegenerative diseases. Though they work in different ways, both ginger and turmeric are very effective anti-inflammatory agents and can be used for different purposes. Turmeric is effective in relieving arthritis pain and helping to heal wounds, while ginger is best for easing migraines, headaches, arthritis, and muscle pain. Considering the growing interest in natural remedies for treating inflammation, the antioxidant and anti-inflammatory effects of ginger should be considered. This is a powerful herb with easily accessible health benefits.